Blogposts » Do We Need an EU Solution for Sovereign Debt? Do We Need an EU Solution for Sovereign Debt? High levels of sovereign debt have become a hotly-debated issue in the Eurozone. The euro crisis has shown how difficulties in one euro-area country can spread to the entire currency union. This briefing outlines different strategies for reducing sovereign debt. 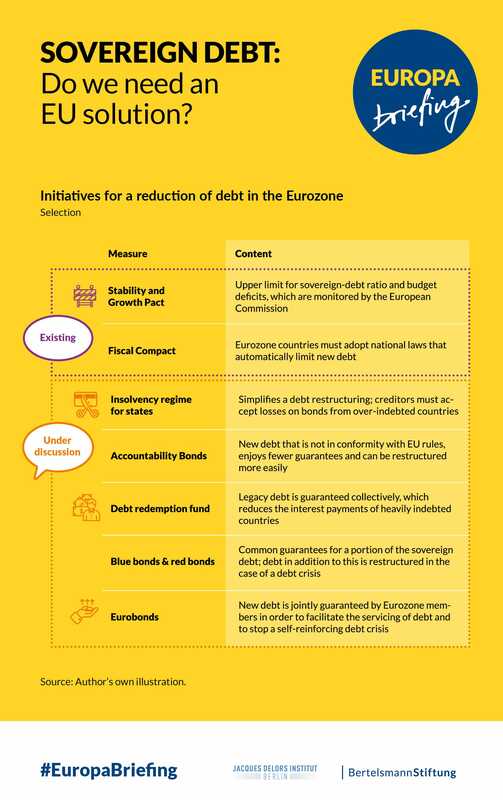 In particular, it looks at whether a stronger role for the EU could help to reduce debt – or whether this should be left to the member states. High levels of sovereign debt have become a serious issue in the Eurozone. This does not just affect the individual member states: The European debt crisis has shown that difficulties in one euro-area country can spread to the entire currency union. What strategies are being discussed for reducing sovereign debt? Would a stronger role for the EU help to reduce debt over the long term or should this be left solely to the member states?